Should the WHO declare climate change a Public Health Emergency of International Concern? In preparation for this year’s World Health Assembly (I will be attending again this year as a WHO ‘watcher’ with the Peoples Health Movement), I’ve been reading a couple of documents produced by the WHO Executive Board that summarise the Organisation’s current thinking on health, environment and climate change (both currently in draft form): WHO global strategy on health, environment and climate change: the transformation needed to improve lives and well-being sustainably through healthy environments (EB144/15); and Global plan of action on climate change and health in small island developing States (EB144/16). These two documents will be circulated amongst and discussed by Ministers of Health at the WHA in May. They represent WHO priorities, vision, strategy and goals for mitigating against and adapting to climate change. This is worrying, for reasons I outline below. But it also got me thinking about what WHO could most usefully do to focus the minds of its member states and mobilise action to prevent runaway global warming, aka Hothouse Earth as one deeply disturbing study coined the phenomenon. One thing the WHO might consider is to declare global warming a Public Health Emergency of International Concern (PHEIC). I consider the pros and cons of such a declaration later in the post. Together, EB144/15 and EB144/16 represent the WHO’s general strategy on climate change and the environment, and a more specific action plan for managing the impact of climate change on small island states (SIS) . It would be preferable for the WHO to have a separate and global strategy on climate change rather than lump the issue together with the environment. Both climate change and the environment are far too complex to be combined in one report. WHO strategies should be separated but synergise. As the planet warms, climate change will soon become an all-consuming issue and – in some respects – WHO is ideally placed to lead a global response. I understand why the Organisation is focusing specifically on an action plan for SIS. EB144/16 reminds us that: “Although all populations are at risk, some are more vulnerable than others”. In 2017 SIS were clearly vulnerable and are becoming increasingly so, but the events of 2018/19 and the pace/intensity/duration/frequency of extreme weather events now unfolding makes it much less clear to determine which member states are most at risk, which are at an imaginary ‘front line’, and even where those line should now be drawn. Increasingly, we are all on the front line now. For example, as CBC reported on the 1st April, Canada’s average warming is twice that of the global average (depending on whose measure and which baseline one adopts), with temperatures ranging from 1.7 – 2.3 C. The intense forest fires that parts of that country are experiencing as a result of this warming highlight the grim reality that there are multiple elements to this crisis impacting multiple countries and regions simultaneously. David Wallace-Wells describes wildfires as “a global pandemic”, citing Canada and the U.S but also Greenland and the Arctic Circle, Sweden, the Russia-Finland border, Greece and Europe generally (DWW, The Uninhabitable Earth p74). Shouldn’t the WHO be preparing a global plan of action for member states whose geographical location renders them at high risk of incineration? I needn’t have singled out wildfires of course. Coastal and inland flooding in regions of Mozambique, the Mid-West United States and Iran also warrant urgent attention. Expect cities such as Guangzhou, Mumbai, Kolkata, Guayaquil and Shenzen to be under water in the coming decades. Will the World Health Assembly be discussing these specific aspects of climate change and developing a global plan of action for member states that aren’t SIS but which are at high risk of flooding? “Health systems and communities around the world are resilient to climate variability and change, and drive down rates of climate-sensitive infectious disease. Carbon emissions meet the targets of the Paris Agreement on climate change. Cleaner energy systems are built, efficient public transport systems promoting active movement are in place, and more sustainable diets and more resilient food systems are promoted and implemented”. It is well known that the Nationally Determined Commitments of parties to the Paris Agreement will lock us into 3-4 degrees of warming (i.e. nowhere near the stated aim of the Agreement of keeping global warming to “well below 2 °C above pre-industrial levels and pursuing efforts to limit the temperature increase to 1.5 °C”). The UN Climate Summit in New York in September is designed to “increase ambition” of signatories to the Paris Agreement as they prepare to “enhance” their Commitments in 2020, to come into effect by 2030. Conceivably, member states will commit to significantly lower emissions, guarantee peak emissions within a few years, and oversee a downward trajectory to zero emissions by 2050 (NB: 2050 is the UN’s target. But if achieved, it will be on the back of significant and continuing carbon sequestration. Many commentators regard this as an unfeasible and morally repugnant policy option). Putting aside the highly problematic 2050 target date for a moment, to even begin the journey towards zero emissions, Ministers of Health will need to feel empowered if they are to pressure their government colleagues to act quickly and decisively. As described in EB144/15, the measures WHO proposes to ensure Goal 4 of its “transformational approach” are insufficient. Ministers of Health will have heard the language of the report many times before. It is nebulous, comforting language; peppered with active-sounding phrases that suggest action without actually delivering it. The WHO calls this leadership, but it is no such thing. MoH: “Oh, well, we have to rethink stuff”. MoH: “Ermm, it’s going to keep promoting Health In All Policies, and help us to articulate what that means. And it says we should strengthen the health sector through my leadership, and develop a regulatory framework, or something. Oh, and it’s going to strengthen governance mechanisms and build ‘high-level political movements and agreements’, develop networks, strengthen partnersh….Nothing, its not going to do anything. We’re just going to drown”. 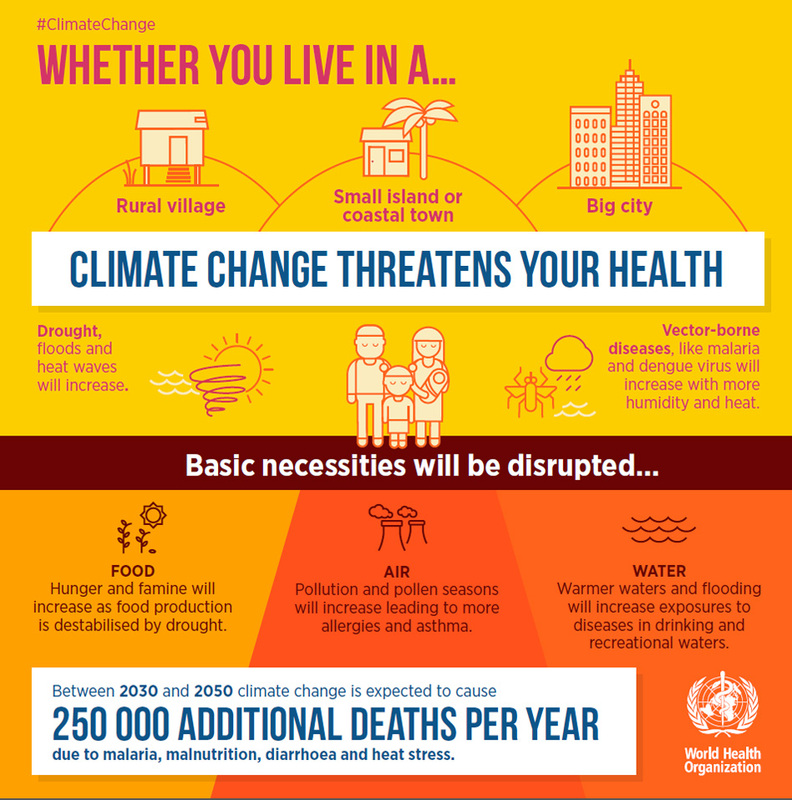 If the WHO really did want to lead, to do something that could empower ministers of health to act beyond the diplomatic sounds-like-doing-something-but-isn’t-really, then here’s something it might consider – declare climate change a public health emergency of international concern. There is absolutely no doubt that climate change is a public health emergency or that it is of international concern. So, at face value, it seems entirely justifiable to declare it a PHEIC. In terms of mortality, for example. Of the four PHEICs declared since the first in 2009, H1N1 influenza virus (aka ‘swine flu’) killed 18,449 by the end of 2010, while 11,310 people were killed by Ebola during the 2014-15 Ebola outbreak. As reported in a previous post, deaths from climate change already eclipse those of H1N1 and Ebola by at least a factor of 10, a number that will escalate almost beyond comprehension as the world continues to warm. Polio was declared a PHEIC in 2014 to prevent the spread of wild polio, which could have jeopardised international efforts to eradicate the disease, and Zika was declared a PHEIC two years later in an effort to curb the global spread of the virus (thereby reducing cases of microcephaly in infants and Guillain-Barre syndrome in adults). In neither case was mortality a driver (number of deaths was small) but the risks of infection and opportunity loss were very high. In terms of climate change, the risks of inaction are – again – beyond comprehension. Not acting now will expose all humanity to the greatest public health challenge in human history. Unfortunately, there’s a snag: when it comes to declaring an event a PHEIC, diseases have a monopoly. Or do they? It falls to the Director General to determine, based on information provided by the State Party within whose territory the ‘event’ falls, whether said event constitutes a PHEIC. In making their determination, the DG considers 5 points, one of which is “an assessment of the risk to human health” as well as “the risk of international spread of disease and of the risk of interference with international traffic” (Article 12 4(e). Well, climate change is going to impact directly on each of those three criteria. The IHR also provides a decision instrument to aid all parties in their assessment (Annexe 2). That instrument provides a stepwise set of prompts and questions: Prompt: “Any event of potential international public health concern, including those of unknown causes or sources and those involving other events or diseases than those listed in the box on the left and the box on the right shall lead to utilization of the algorithm” (my emphasis). Question: “Is the public health impact of the event serious?” Question: “Is the event unusual or unexpected?” If yes: “The event should be notified to the WHO under IHR”. If no: “Is there a significant risk of international spread?”. If yes, again, the event should be reported to WHO. If no: “Is there a significant risk to international travel or trade restrictions?”. If yes, refer to WHO; if no, then don’t but be prepared to reassess (Annexe 2). 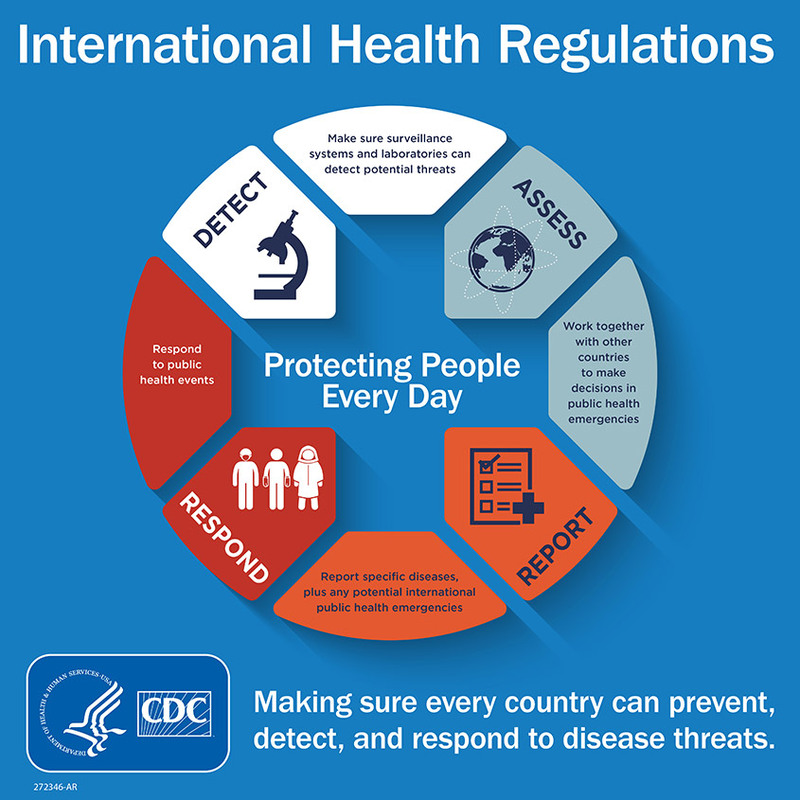 It seems to me that even though the IHR are generally regarded to be concerned with preventing and, where necessary, responding to the spread of diseases across national borders, there is flexibility to extend the scope of PHEIC to public health concerns that are not disease-specific. Recall that very first prompt – “Any event of potential international public health concern”. Furthermore, the WHO acknowledges that there’s a multi-hazard dimension to the Regulations: “WHO helps countries to prepare for and respond to a wide range of public health events through its programs on infectious diseases, food safety, environmental, chemical and radio-nuclear safety”. So it may not be entirely against the spirit of the regulations for WHO to consider non-disease-specific events. Of course, there are some very valid objections to not expanding the scope of the IHR to include non-disease threats. For one, and I’m thanking anonymously a colleague who knows about such things for this observation, it would water-down a beleaguered international health agreement. Too few member states adhere to the regulations as it is, and introducing non-disease emergencies could easily provide an excuse for them to withdraw from it altogether. But consider the threat that we now face from climate change, and consider the effect that WHO declaring it a public health emergency of international concern could have in mobilising action. If the WHO really is serious about leadership, then this is how I think it should lead. 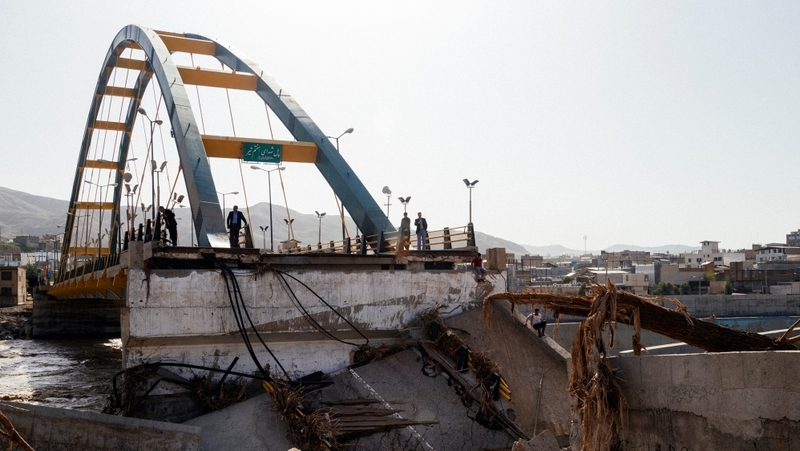 At a time when, globally, social environmental movements are calling on their governments to declare climate change a national emergency, shouldn’t we be calling on our international institutions to do the same? Previous Post Global health and climate change: A call to action. Thanks for this; it is thought-provoking. Declaring climate change as a Public Health Emergency of International Concern would attract a bit of publicity, but what would happen next year? Or next month? I’m afraid the media will quickly lose interest. Your imaginative anecdote about President Nyusi is spot on. For leaders in the (global) South, national action on climate change mitigation has long been very low on the agenda; that is understandable and appropriate. “Health in all policies” is a largely meaningless aspiration, especially in the South .. but even in the North; comforting, perhaps, to health academics, but surely largely dismissed by politicians concerned with defence, or economics. WHO’s poster mentioning an extra 250,000 deaths per annum (from 2030-2050) due to “malaria, malnutrition, diarrhoea and heat stress” is interesting to me, as I was peripherally involved with the team working on this estimate, about 10 years ago. The total number then was similar to that in the poster, but the big difference is that the poster excludes extra deaths from conflict. (I think 10 years ago the statement would not have specified those 4 conditions, even though the fine print did.) I think that explicit mention is an indirect concession that climate change may have other impacts, event though numbers are harder to pin down. In 2009 it was very adventurous to speculate that climate change might contribute to conflict (i.e. in the near future – some of the very first papers in the health literature, from 1989, did indeed mention conflict – but without speculating a time) , although (even by then, in 2007) UNEP had done this with regard to the civil war in Darfur. Now, after many papers linking the drought in Syria to its civil war, at least in part, the position is now less contested. However conflict is still generally seen as an issue peripheral to WHO and to the health community in general. WHO would risk internal and external criticism (for exceeding its mandate) if it were to (say) treble the 250,000 figure by including climate change associated conflict deaths. I don’t think WHO should make this declaration, because there are so many other issues that could also be justified (poverty, high population growth, philanthrocapitalism, nuclear weaponisation) .. and while Zika and polio have lower death tolls than climate change, others, such as tuberculosis, are higher (but will not be classed as emergencies as they are chronic problems not newly diagnosed). I also doubt that such a declaration will work because the real emergency is not so much climate change but the risk of civilisation catatstrophe, emerging from one of many paths for existential risk, eg Hothouse Earth (as you mention), or perhaps short of runaway greenhouse gas accumulation, via collapse of the Gulf Stream, or accelerating ice shelf collapse leading to rapid sea level rise, or a rapid loss of the Himalayan ice (leading to famine and conflict in South Asia) .. or all of these, all leavened by dysfunctional human behaviour, especially violence and dehumanisation of the other (eg as occurred during the Rwandan genocide, but characteristic of many wars. Although I can easily conceptualise climate change as leading to collapse (and so can Swedish school activist Greta Thunberg) most people cannot, and trying to convince them of this will be very difficult. Would the UN in general declare something to the effect that civilization is indeed in crisis, as David Attenborough has? Might WHO help lead the way (within the UN system) with such a declaration? I doubt it, but a campaign that asks them to consider this might have some benefit.